A similar game was first released in 1974. Under the name Connect Four, it immediately became popular all around the globe. Since then, there have been many different clones with names such as Connect Four, Four in Row, 4 in Line, etc. This brand new clone is designed for iOS! You play against our AI, and gone is the plastic framework! When we designd this App we put a lot of effort in the minimalistic use interface, in the AI, and in the superb user experience. Congrat! This App is currently aviable at App Store! When we developed this App our goal was never to imitate the original plastic framework. Instead, the goal was to design a completely new user experience. 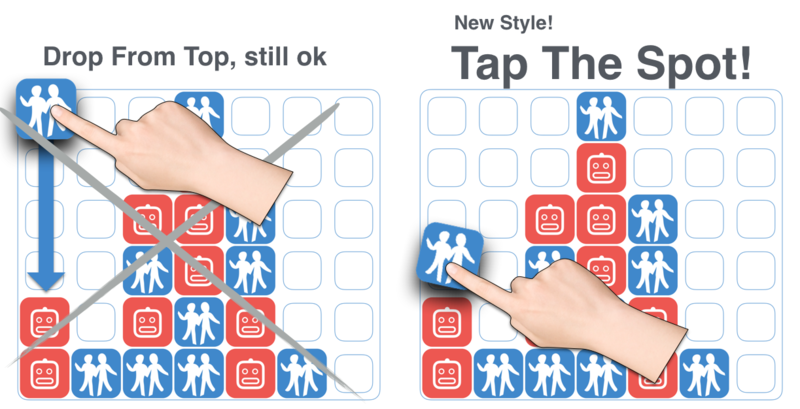 You will encounter the new feeling as soon as you play your first move! You may still drop from top, if you like to, but the new style is tap the spot! 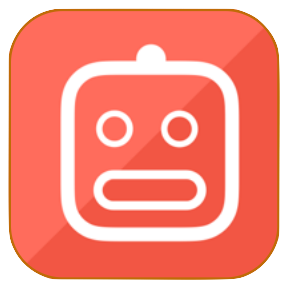 We will soon return to the new user experience, but first we must consider the AI! AI means Artificial Intelligence. Our AI is good. When we where developing this AI we soon began to fear that it might become too good. We asked ourselves: Is it really fun to loose? For a while, we thought we had to limit the AI. Let's face it, most connect four clones on App Store are not very intelligent! The following is however a mathematical fact: The player that makes the first move has an advantage: when you are the first player, you can, theoretically, beat any AI if you play perfect! Since it is possible to beat any AI if one plays well, we feel that we should not weaken our AI on porpose. In fact, our objective is to make the AI as good as possible. But how can we make it fun to play against a good AI? This question lead us to an insight. The user should never have to loose! Instead, he or she should be able to rewind the game back to a previous non-loosing state whenever necessary. This alters the spirit of the game quite a lot. The new game is more like finding a path to a winning state in a logical maze! Whenever one is about to loose, one should be able to backtrack a few steps and try a different path! But this completely new idea involves a grand challenge. How should the user interact with the touch screen to order the roll back? It is time to return to the user experience! When dragging a brick, any brick, you will actually capture and drag all bricks that have been played after that particular brick! If you capture the AI brick, you will also drag the human brick played before that brick. In any case, this means that you can undo multiple moves in a single swipe! And, ultimately, this means that you can win against our powerful AI!